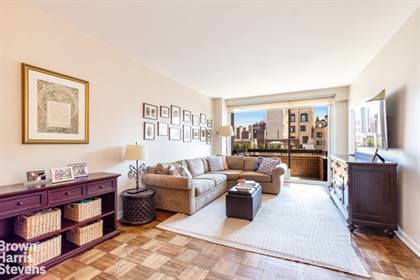 Move right into this renovated 3 bedroom home in the heart of Carnegie Hill. This high floor unit boasts lots of light, a private balcony, an open eat-in kitchen and a washer/dryer. The spacious master bedroom has a full bath en suite, 3 closets and a big picture window facing east over pretty plantings of prewar buildings on Park. The second bedroom is also generous in size (can comfortably fit bunk beds or 2 twin beds) and has a wall of closets. The third bedroom (converted off the living room) faces south and could easily be used as a separate home office or den. The recently renovated windowed kitchen has an appealing open design and features Quartz countertops, custom cabinets, stainless steel appliances and a built-in garbage disposal. Other details include newly replaced AC/heating units with individually wired thermostats (allowing for multi-zone temperature control), custom outfitted closets throughout the apartment and a 9' x 6' balcony off the living room which is a peaceful retreat from busy city life. 45 East 89th Street is a coveted full-service building with amazing amenities that are unique to the neighborhood. The rooftop pool is open year round and the rooftop gym is newly updated and offers a variety of equipment including Peloton bikes. Other amenities include an on-site garage, 2-story roof deck, children's playroom and basement storage for bicycles and luggage. Situated on the corner of Madison Avenue and 89th Street, this wonderful location is only 1 block to Central Park and the Reservoir and is in close proximity to many of the city's best public and private schools. Hi, I'd like to find out more information about 45 East 89th Street. Thanks so much!